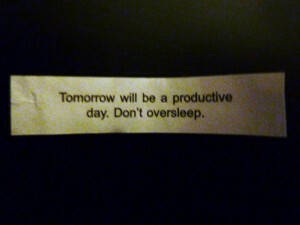 Tomorrow will be a productive day. Don't oversleep. But tomorrow is Saturday! A no alarm clock day. 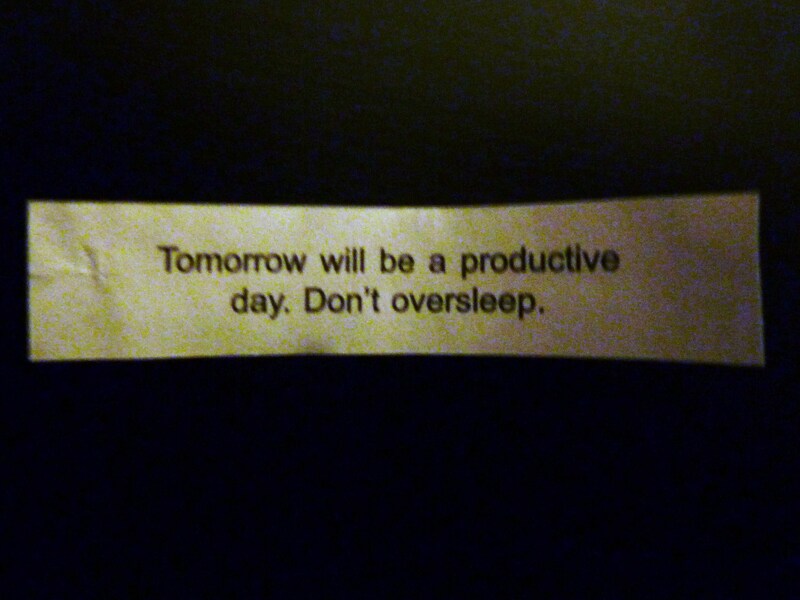 This fortune is sooooo not fair. We’ve got our first completely unscheduled weekend in ages. And I’m not supposed to sleep in a little? Although these days, “unscheduled” means more time for projects around the house. And I did publicly commit to getting a number of things done before the end of the year, which is really not that far away. Hugh is planning on getting started with the sump pump installation.Â I want to at least finish up the hallway baseboards plus paint and install the closet door in the Red Room. Among the gazillion pre-holiday sale emails I get every day I saw that Home Depot has 20% off on a lot of drawer pulls, so that would also cross something off the 2010 to-do list. And then there are some things I’d like to get done that aren’t on the official list. So it looks like I’m going to have to be productive after all if I want to get it all done. No lounging in bed all day for me.